Winner, The Man Booker Prize, 2015 Deftly spanning decades and continents and peopled with a wide range of characters - assassins, journalists, drug dealers, and even ghosts - A Brief History of Seven Killings is the fictional exploration of that dangerous and unstable time and its bloody aftermath, from the streets and slums of Kingston in the 1970s, to the crack wars in 1980s New York, to a radically altered Jamaica in the 1990s. I can’t begin to talk about how amazin this audiobook is, the best i’ve heard the best book i’ve ever heard as well. 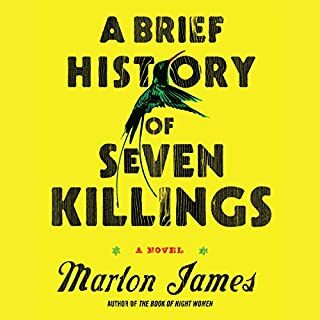 Multiple characters, multiple storylines all bound together by Bob Marley (the “singer”) that shows different views of what it was like in Jamaican Ghettos, Jamaican NY, CIA during cold war and more. I must say...the voice actors did the absolute best possible, they also perfected the Jamaican patois which I love. I reccomend this to ALL.